Majorca Cycling Holidays, Mallorca is the cycling-tourism place per excellence and for that reason there are tourists that come only for practicing this discipline from all over the world. Linking sports with outdoor activities, such as the sun and the beach, and at the same time riding a bike is possible in Majorca. There are so many routes that you can make and there are many companies that offer bicycle rental for tourists from only a few hours, up to the rest of the day. This gives you an additional liberty of movement to visit the city, or any other route you wish to discover. Let’s go deeper with this on the following paragraphs. From Plaza España to La Universidad This route starts from the city center and it will take us to the University which is located in the outskirts of the city. We have the option to make the entire route using the bicycle track. The route is very comfortable and will lead us to go for about 7 or 8 km, depending on the route we take, in a half an hour, or 40 minutes without so much effort. From Plaza España and Se Stations park, we go through the bicycle track hitting Jacint Verdaguer up to get to Jaume Balmes track. We turn left, until get to Abbu Yahya. During this travel, the most experienced bikers who are used to the traffic, can do it on the 31 de Diciembre avenue, which is something faster, although we go through streets with various tracks along with the rest of the vehicles. From La Vileta to the Downtown. La Vileta and Son Rapinya are two of the peripheral neighborhoods that they were pendency before at the outskirts of the city. In this case, the travel also is for using the bicycle tracks to go down, the downtown of the city. Going from La Vileta, we take the biking track parallel to Son Moix, through Camí, dels Reis up to reaching Camí, de Jesús, then you can turn to right, following the bicycle track and which takes us without getting off from it, finally passing through the cemetery and the park of Sa Riera, up to Andreu Torrens. Cycling in Majorca, with the arrival of good weather, sun and more lighting hours, the truth is that the only thing you wish to do is take a bike and hit the road! It is an excellent moment to make all the revisions needed, wear a helmet and start pedaling. But, where are we going? 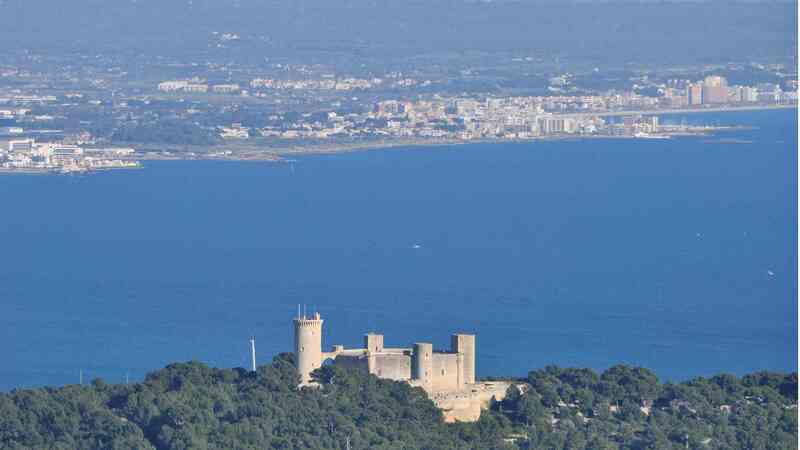 Palma de Mallorca has many interesting routes to see the city in a different perspective. Palma de Mallorca is an excellent city for those who like riding bikes. Its dimensions invite you to go around and complete the route in only half an hour or forty minutes the entire city at the reach of our pedals. And if, besides that, we add the fact it was built some kilometers in having a track especially for bicycles, the result is absolutely interesting for the user who wants to ride a bike. apart from that, we can mention that the city does not have much excessive slopes, although we have to point out that as any single coastal town, if we go deeper we can find a slope here and there. Apart from that, the city center of the city and the space between the ring road known as the waist way and the small streets with only one track and no so much traffic, in which your bike can be ridden with no difficulty and safely, we can propose some routes. Two that cross the city from the highest point to the lowest and the other travels all the maritime front. We hope you enjoy these routes as much as we enjoy giving to you. Holidays in Majorca Riding a bike. As it was mentioned before, there are many options to do in Mallorca. Trekking, playing golf, scuba diving, sports fishing, climbing and, of course, riding bikes are just a few examples of the range of possibilities you can do in the island, if you want to do something different, apart from partying all day long and get drunk. bike transfer mallorca is the option for those very active tourists who love outdoor activities. You have to be aware though, that there are certain rules before take your bike and going to and fro around the island The first thing that you have to take into account is your own safety. Please, do not forget to use all the implements needed. First of all, do not forget to put on a helmet. Use goggles to protect your eyes, and have a license to go without restrictions through the main avenues and streets. Please, do not forget to pay attention to the signs and the traffic lights, and respect others’ way to go. If you follow those simple rules, you will enjoy that wonderful trip! Going through the Promenade. Finally, a very used trip by tourists that visit the city rather than the locals is the one that goes throughout the Promenade. From the Palma Beach to Porto Pi this travel is for those that visit the city for the very first time, because you can pass just in front of the Palma maritime façade that looks at the Cathedral, the I’Almudiana Palace, La Lonja, Palau de la Mar, or Es Baluard, besides that, there are an important collection of boats and ships that are docked on the port. Once you arrive to Palma de Mallorca, either at the airport hotel, or through boats,bike transfer mallorca will be a simply as make your reservations in advance in one of the agencies that rent bicycles in the island, or in case you bring your own, put in contact with the tourist office. They will be pleased to guide you for having the best and the safest experience of your life riding a bike on this wonderful paradise.